Chairperson of the Parliamentary Portfolio Committee on Information Communication Technology, Postal and Courier Services and MDC-Alliance legislator for Kuwadzana East Mr Charlton Hwende today beat a hasty retreat on his twitter handle after receiving brickbats for threatening founder and executive chairman of Econet Group Mr Strive Masiyiwa. In a tweet last night, Hwende threatened to have MDC Alliance supporters boycott Econet services after Mr Masiyiwa called for the removal of illegal sanctions imposed on Zimbabwe by the United States. "What if the @mdczimbabwe encourages its supporters to ditch Econet for @NetOneCellular or @Telecel_Zim? 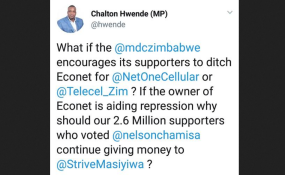 If the owner of Econet is aiding repression why should our 2.6 Million supporters who voted @nelsonchamisa continue giving money to @StriveMasiyiwa?," read the tweet. Mr Hwende has since deleted the threatening tweet after receiving brickbats from his followers and other social media users for bias. Fiery Norton legislator Temba Mliswa tweeted: "@hwende as intelligent MP, my dear Honourable brother, I think you should 1st show you have power by convincing the electorate to vote for you & not say the election was stolen.2. It's unfair for us to use politics to think we can dictate how people make choices." One post on Facebook read: "You can't even mobilise your supporters to pay off your legal fees following your loss at Concourt..furthermore, you can't even mobilise your supporters to pay-off your arrears to employees etc which have resulted in the sheriff attaching MDC property at Harvest House... so stop this buffoonery,"
Social media users have called on Hwende to step down as chairperson of the ICT portfolio committee alleging that he is conflicted and biased.